On offer from us is a wide gamut of Fancy Tower Bolts (Flat Flower), which is fabricated using high-grade brass & other raw material. Apprised for their enticing designs and contemporary looks, these products are used with all types of doors in various establishments. Furthermore, our professionals hold expertise in manufacturing these products as per the choice & preferences of the clients. 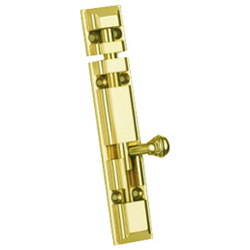 We are a pioneering enterprise, engaged in manufacturing, supplying and exporting a wide assortment of brass and stainless hardware and baskets. Our range is known for its perfect finishing, high tensile strength and corrosion resistance.